Creativity and teamwork are essential to transforming business process. Most processes center on content – files and data. SharePoint gives you tools to gather and manage data in lists and libraries. Office 365 provides connections to a range of third-party systems with Microsoft Flow and PowerApps. Flow lets you easily automate business processes. PowerApps lets you create great forms and mobile apps based on SharePoint files and data. See how NASCAR uses PowerApps to extend their SharePoint intranet for real-time engagement with their staff at dozens of racetracks around the world - all the way to pit row and the championship circle. Discover how Visiting Nurse Service & Hospice of Suffolk (VNSHS) created a digital way to track processes, communicate between care providers, and improve staff mobility with Microsoft Flow and Office 365. Experience the simplicity and power of SharePoint Business Apps with our self-service demos. A demo that shows how the custom SharePoint list experience combined with Microsoft PowerApps offers advanced capabilities for discovering and editing list items. Experience how easy it is to use Microsoft Flow to integrate intelligence into Office 365 with Cognitive Services and cloud AI. Discover more about the power of SharePoint Business Apps with our prerecorded conference sessions. No-code and low-code applications have been essential tools in Microsoft SharePoint for a long time, but we’ve added many other new tools to your palette. 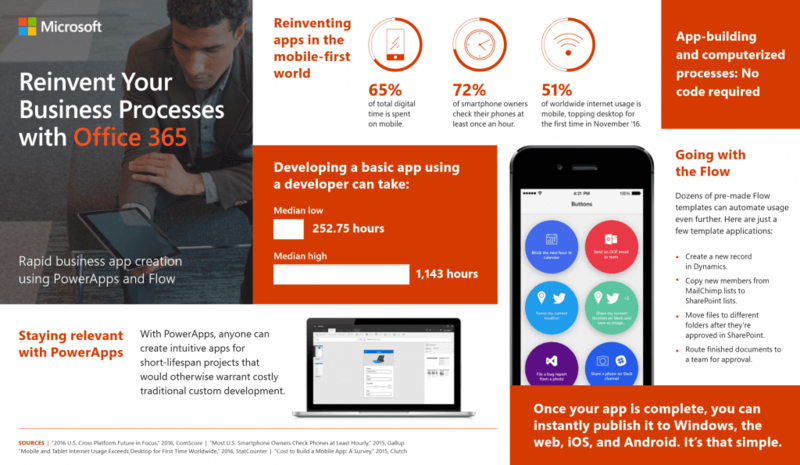 We review the roadmap and best practices in our platform for creating business apps solutions (lists, Microsoft PowerApps, forms, Microsoft Flow). We also discuss the patterns to help transform customer solutions that still remain on premises and/or in legacy tool sets like InfoPath, SharePoint Designer or Access web apps. See the future of self service data management with SharePoint lists, as part of Jeff Teper's keynote in Las Vegas from May 2018. With this downloadable template, you can add PowerApps to your SharePoint list for a complete self-service Help Desk app. Fab! PowerApps provides a low code way to create custom solutions for SharePoint that unlock new capabilities for your business users. Extend SharePoint with PowerApps to replace your InfoPath forms today. Chris Kent, one of our MVPs, has released a free tool to automate generating custom column formatting scripts. Build really powerful visuals for your lists and libraries.